If you’re living with a gap in your smile, whether you’re missing a single or multiple teeth, you understand the toll it can take on not only your smile, but your life. Missing teeth can make it difficult to enjoy your favorite foods, and to speak and smile with confidence. Thankfully, at Spring Creek Dentistry we can restore your smile in form and function with a porcelain bridge. A bridge is a dental appliance that is used to replace missing teeth. 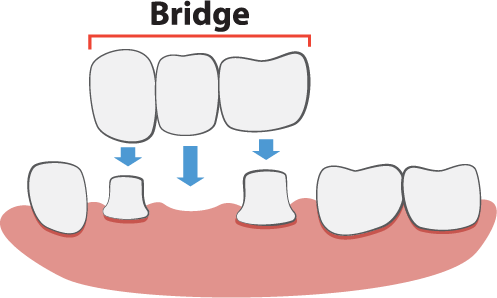 Bridges can replace a single tooth, or multiple teeth. Just as every smile is as unique as the individual who wears it, every bridge is custom-made to fit your smile and your needs. Bridges are made from beautiful, natural-looking porcelain that mimics your natural teeth in appearance, feel, and strength. If you are looking for a permanent solution, we can fit you with a fixed bridge. A fixed bridge will be anchored to the surrounding teeth with the help of dental crowns. We can also secure your bridge further and preserve the health of underlying jawbone with the help of dental implants. For a more temporary solution, we can fit you with a removable bridge that is secured to surrounding teeth with metal clasps. Speak, laugh, and smile with confidence in a complete smile! If you have any questions about dental bridges, or would like to schedule a consultation with your Spring dentist – Dr. Oakley, Dr. Henley, Dr. Miller, or Dr. Wendt – please contact us at Spring Creek Dentistry today at (281) 407-8333 .